hi. enjoy watching ur show with my wife, Conehatta, Mississippi. is family from france or Ita?? HI Angela! Illinois. Any idea where I can get a used or reasonably priced, good quality dressform? I store my patterns in a large file cabinet. Do u organize by color? I think I need to do this. I have over 5 large totes…do I have a problem? Loxahatchee FL. Hello! You’re a great teacher ? My local print shop charged less than $5 to cut all 100 boards to fit the IKEA non-U.S. standard size drawers. I have fabric up to about 4 yards on the boards. Trying to find out if you can use the magnetic hoops on the new Luminaire? 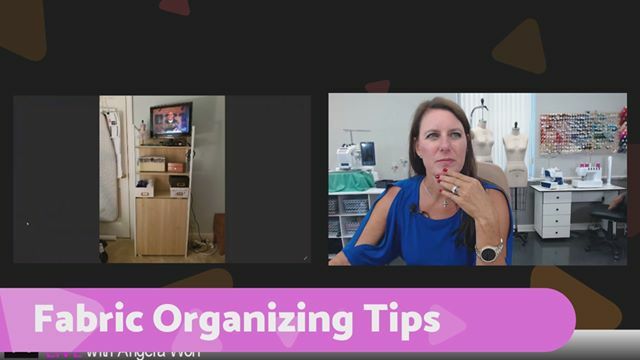 I love your serger corner! So sorry I missed your show yesterday. I’m back in town now and watching your show from yesterday. Love, love your videos!! Tuning in late. Couldn’t make it live. Had to get my auto threaded fixed on my bernina and decided to bite the bullet and bought a cover stitch machine before I left. Can’t wait to sew something Only been playing on it so far. I think I am going to love it!! Hello from hot and humid Missouri. I am very late today in watching this broadcast. I had to take hubby to the VA hospital this afternoon. Angela…not sure where you reside, but I live in Arizona and wondered what the time difference is so I can watch your program in real time. Thanks. The time Angela is on in AZ is 10:30am until Michigan time change in October then we will be 2 hours earlier. From her time of 1:30pm so we will be watching her around 11:30am AZ time. in a couple of weeks when the time chages for everyone but us and Hawaii. Hi Angela, Tuning in late here. I agree the boards are better for smaller amounts of fabric. I got some of the large empty bolts from Joanne’s for free one time. They gave them to me when I asked and said they were only going to get rid of them Also I know someone that stores them on empty wrapping paper tubes. I ask first, but YES I always walk up to people about something they are wearing! Usually it is ” I am not weird, I just sew and…” Most times I admit “I am weird” but they understand…I think! Hello after the show from Knoxville, TN Love your show. I have drawers and use the magazine boards. I have one to three on all of them and color coded. Works great! Very quite. What is the back of the fabric? Leal Gaby it Glidden® High Endurance® Grab-N-Go Paint + Primer from Home Depot?? This time with the birthday sew I hope to be able to sew with ya all. how did you fare in the hurricane? Wow that is quiet, that IS crazy. I was weed eating, sewing and making a Gothic funeral coach so I went right thru your show! Hi, worked late today ? Here late as usual. Looking forward to watching. Angela Wolf, on the first one, that is an ironing space on top. It is an antique chest that was my MILs, it has a marble top, so I had Kirk put a wood cover over the marble and then I padded and covered it. It works great and I get to enjoy this beautiful piece. Thank you for showing my photos. Just purchased a new serger! Need this from Appleton WI? Hello from Newbury Park, CA. Haven’t been motivated to sew lately. Yes I have to touch the fabric! How do you store scraps? Do you organize it or just stuff it in the container to check for more later? I organize 42-44″ fabric on comic book boards. 54″ – 60″ on cardboard cut from boxes. Wools are folded on themselves…no boards. Hello from Long Beach, CC! ? I missed you again! I’ll watch tonight! I have an alteration shop and we do complete measurements for customers. JoAnn’s. will give you the cardboard things that fabric comes on when there are no more fabric on them if you ask for them I ask all the time? A tailor will take measurements for about $5 or $ 10. Hi Angela. Too late to see you live. Hi from NH. Thanks again have a great week! Bye. Have a good week! Have a good rest of the week Angela and Julie. Bye! Jules, stay safe and dry! Safe travels Angela! Bye friends! Have a great week!!? just reinforce any holes you make…. I can’t wait to come visit!!!!!! Top of a raskog from ikea. Flip the top to the flat side. Add a cutting board for stability. Garage sale, put your own casters on! Dollar store foam core board works great to wrap fabric onto. Sandi, you are on a roll today!!!??? They wrap the fabric arround cartons. The girls now me and I just ask. I did paint my thread holder teal. Yes, dogs with floppy ears get ear infections quite frequently. Make sure to dry them well when they get wet. Now that’s one I would want to pet! Shipped with love! With a double p! Gong to puyallup this winter. When will the classes open for registration? ice cream out your nose is a funny visual!! Winn does sign the orders now! I liked mine! Love a good Cody story!? You could do tours ? ****WHAT???? **** No bow around you???? ?